Why does the result of cutting a Möbius strip down the middle lengthwise have two full twists in it? I can account for one full twist--the identification of the top left corner with the bottom right is a half twist; similarly, the top right corner and bottom left identification contributes another half twist. But where does the second full twist come from? Explanations with examples or analogies drawn from real life much appreciated. edit: I'm pasting J.M. 's Mathematica code here (see his answer), modified for version 5.2. One twist comes from the two half-twists of the Möbius strip. Another comes from the fact that just after you've made the cut, the resulting half-width strip goes two times around the cut, so it will turn an extra time when you unfold it to a large circle. Try making an ordinary strip that goes two times around a cylinder and then meets itself, without a Möbius twist. If you remove the cylinder and try to unfold your strip to a circle, it will have one full twist. This twist arises from the fact that the strip's centerline must wind around itself when it goes around the cylinder twice. (In the cut-Möbius case, the direction of this winding depends on the direction the original Möbius strip was twisted, which means that the single twist from the unfolding adds to the two half-twists rather than cancel them out). Another everyday effect that shows this (in reverse) is to try to wrap a rubber band (an ordinary cylindrical-section rubber band with a flat cross section) twice round a package. It will need to twist in order to do this, even if it can lie flat wrapped once around the package. I seem to be terribly late (I'm quite slow as a typist), but hopefully this answer is complementary rather than redundant. 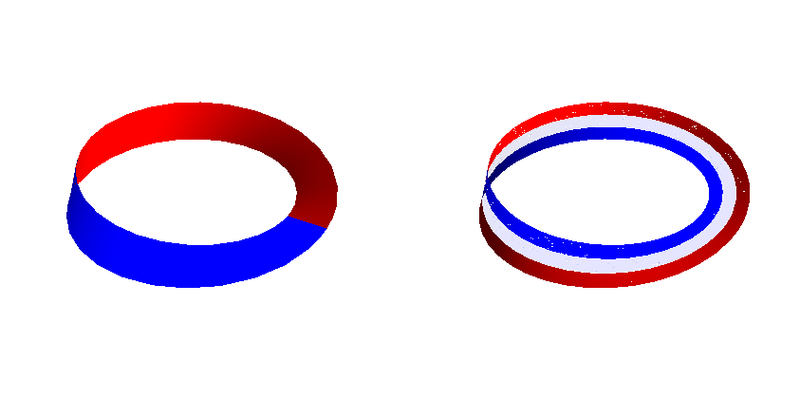 That the Möbius strip has a single "twist" is apparent in the color clash that appears when one attempts to color one "face" red and the opposite face blue. This color clash does not occur in the cut strip, as one requires two twists to finish a circuit through the surface. One can verify that the normal vector expressions at $u=0$ and $u=2\pi$ are not equal, but the normal vector expressions at $u=0$ and $u=4\pi$ do agree. This means that if you trace a pencil through the surface of the usual Möbius strip (that is, fix $v$ and vary $u$), after exactly one turn through the surface, your pencil should end up at the spot exactly under your original starting point. For the "cut" Möbius strip (same parametric equation, but $0 \leq v \leq \frac23$ and $0 \leq u \leq 4\pi$), two turns ($2\times2\pi$) will return your pencil to its starting point. Observe that the boundary of a Möbius strip is a circle. When you cut, you create more boundary; this is in fact a second circle. During this process, the Möbius strip loses its non-orientability. Make two Möbius strips with paper and some tape. Cut one and leave the other uncut. Now take each and draw a line down the middle. The line will come back and meet itself on the Möbius strip; on the cut Möbius strip, it won't. Not the answer you're looking for? Browse other questions tagged general-topology intuition surfaces visualization mobius-band or ask your own question. Can you really construct a Möbius strip from this model? Is it possible to define a frame on the Möbius strip? This quotient space is homeomorphic to the Möbius strip?